BO SCHEMBECHLER photo art print photograph picture for sale. 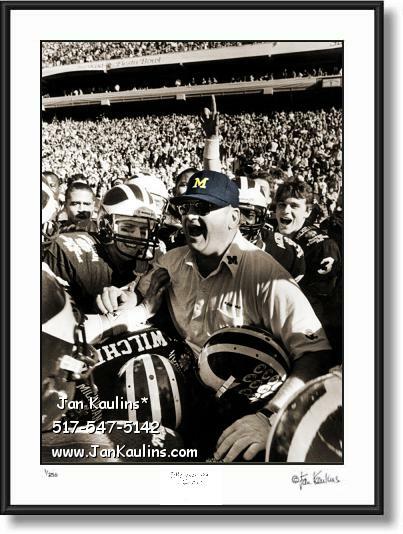 BO SCHEMBECHLER UofM photograph art print for sale. This is a historic photo from 1986 of legendary University of Michigan Wolverine football Coach Bo Schembechler being carried by his players following a 27-23 victory over Nebraska at the Fiesta Bowl. This fabulous historic Bo Schembechler photo from almost 30 years ago has been recently discovered and and now being offered as a sepia toned fine-art print. The original black and white 1986 photo has been reproduced and is hand-colored (Bo's hat) and printed by nationally recognized artist Jan Kaulins. In this victory photo we can see a smiling Coach Bo Schembechler being carried off the field by the players of his winning team lead to victory by quarterback Jim Harbaugh. The 1986 Fiesta Bowl was a college football bowl game played on January 1, 1986 at Sun Devil Stadium in Tempe, Arizona. It was the 15th edition of the Fiesta Bowl. In the game, the Michigan Wolverines, second place finishers in the Big Ten Conference, defeated the Nebraska Cornhuskers, runners up in the Big Eight Conference, 27-23. Michigan running back Jamie Morris and Michigan defensive tackle Mark Messner were named the game's MVPs. Here's the game summary: Michigan scored the only points of the first quarter, with 11:19 left, on a 42-yard field goal from Pat Moons, giving Michigan an early 3-0 lead. Nebraska scored on a 5-yard touchdown pass from quarterback McCathorn Clayton to running back Doug Dubose to give Nebraska a 7-3 lead. Dubose scored on a 3-yard touchdown run later in the period to give Nebraska a 14-3 advantage at the half. Michigan came out of the locker room and dominated the third quarter, in part due to a couple of Husker miscues. DuBose fumbled on the third play of the second half and the Wolverines recovered at the Husker 21. Gerald White scored four plays later on a 1-yard touchdown run to pull Michigan to within four points. Clayton fumbled on Nebraska's ensuing possession, and Michigan quickly capitalized again, this time on Jim Harbaugh's 1-yard quarterback sneak, putting Michigan ahead 17-14 just over four minutes into the third quarter. Following a blocked Nebraska punt, Moons kicked his second field goal of the game, a 19-yarder, to increase Michigan's advantage to 20-14. Later in the third, Harbaugh scored his second rushing touchdown of the game, a 2-yard run, to give Michigan a comfortable 27-14 advantage. In the fourth quarter, Nebraska coach Tom Osborne decided to spark his sputtering offense by inserting talented freshman quarterback Steve Taylor into the game. Taylor drove the Huskers 64 yards from their own 3-yard line driving deep into Michigan territory before turning it over on downs. However, Nebraska forced a three and out and was able to drive 77 yards in 12 plays, capped by Taylor's 1-yard touchdown run to pull within 27-21. Michigan found itself backed up in the shadow of its own end zone. Rather than risk disaster, they decided to take an intentional safety with just over a minute remaining in the game. Trailing 27-23 with 1:14 left, the Huskers set out from their own 46 with no time outs left. The Wolverines intercepted an errant Taylor pass in the end zone to kill Nebraska's final threat.